Some people said, one of the biggest successful marketing channel that engaged by Opposition Party in the 12th General Election is 'SMS marketing'. Do you agree with this? I think many people will say YES if still remember on what happened in 5 years back. But what about 5 years later in this 13th General Election? 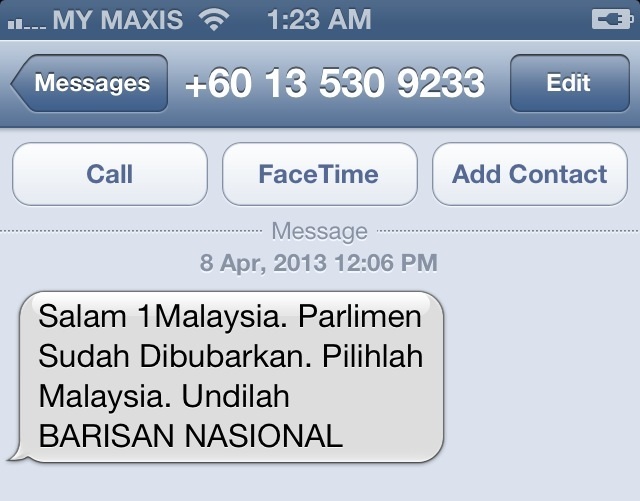 Will SMS marketing still popular in this 13th General Election? So, let's us review this issue together and to see on what happened in SMS industry for the past 20 days before our 13th General Election or Pilihan Raya Umum ke-13 (PRU 13) on 5th of May 2013. During this pre-election period, we still see the 3 standard types of SMS channel that being used in 2008, and still being used this time to promote their election campaign. What are the 3 standard SMS channel? This is the regulated method by local Telcos in Malaysia. That mean each of these SMS are sent directly via local Telcos by licensed company such as EVERWORKS.com. As we know, this method is usually the most expensive method in market. The price is about RM0.09 to RM0.06 (depending on their volume). From the sample here, you may notice this SMS is sent from '63001', where this is a registered short code that by belong to a licensed SMS company. Of course, this SMS company must have agreement with all local Telcos, such as Maxis, Celcom, and DiGi in order to provide such SMS services to their client. From our survey in this 13th election, we believe this is the most popular method for our Malaysia politicians to delivery their message to their targeted audience. This method will be much cheaper than the method#1 as all these SMS will sending into Malaysia Telcos via international providers. 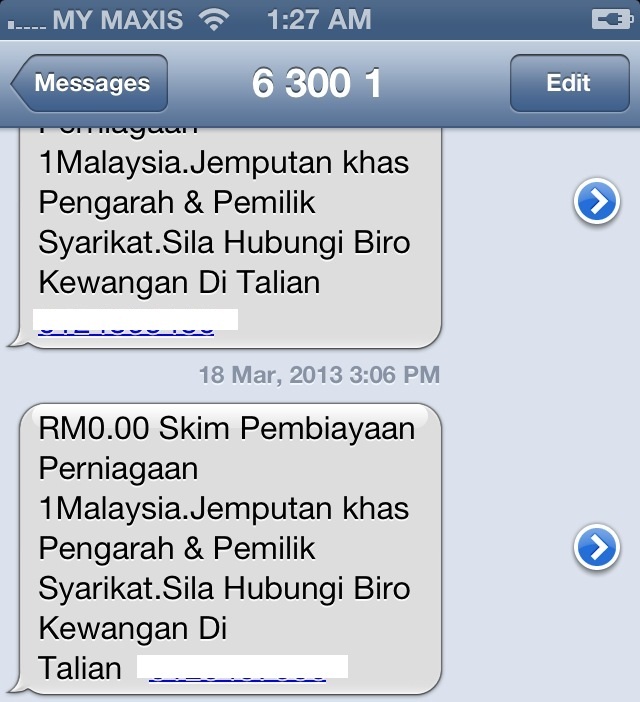 The market price for this channel is about RM0.05 to RM0.04 per SMS. But this method has been banned by all Telcos, and even MCMC (Malaysian Communications And Multimedia Commission) has banned this method due to some security reasons. 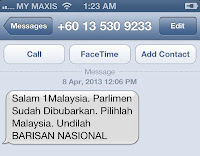 Many Telcos in Malaysia has already implemented some filtration tool to prevent such SMSs to reach their mobile users. How to differential whether this SMS is from International bulk SMS? The most simple way to identify international bulk SMS is from the SMS's Sender ID. It's sender ID is usually come with some international number such as +143839301113. From our survey, we found out some politicians are still using this method in sending their political message to the mobile users. But all their SMS content did not carried or mentioned any of name or party. 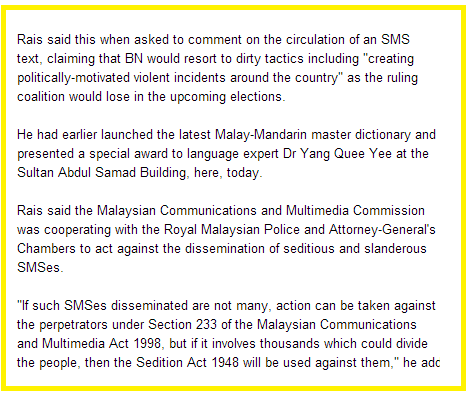 They are merely to carry out some general message that related to everyone in Malaysia. In summary, this method is cheaper than local bulk SMS, but giving the same delivery speed like local bulk SMS. The main disadvantage is Low Delivery Rate, as many of our local Telcos already started to block international SMS. What is P2P SMS? P2P mean Person-to-Person messaging method that initial by normal Telcos SIM card, and this method is just like how we send a SMS to person via our mobile phone. This method is always the most direct, and most high delivery rate (I would say 100% delivery). 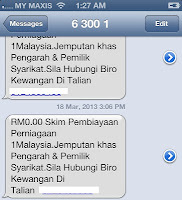 P2P SMS is among the cheapest method in the market, selling price about RM0.05 to RM0.03 per SMS (depending on volume). But the main problem is the Delivery Speed. From testing, the speed of sending one SMS will take about 5-6 second from one modem (that's why P2P provider will have purchase a lot of modem in order to increase their sending speed). From our survey, many politicians are engaged to this method to delivery their SMS, which I believe they are engaged to a 3rd party to delivery their SMS. How it work? 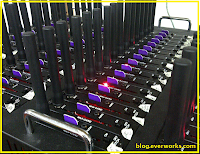 Basically, the SMS Provider will purchase some SMS modem and local prepaid SIM cards from each local Telcos, then they will configure these modems to work with a SMS broadcasting software such as SMS Caster that installed on a server or even personal computer. 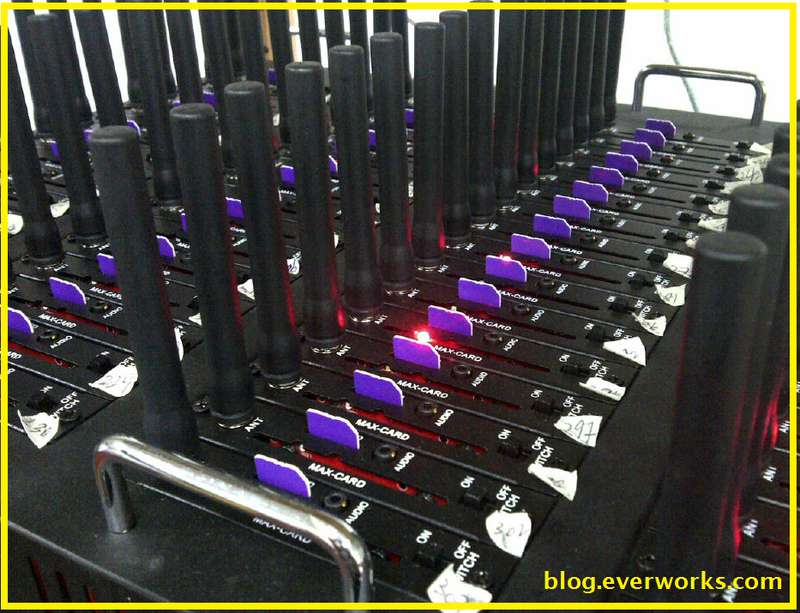 In P2P industry, SMS Caster is among the most popular SMS broadcasting software for GSM modem. User can easily upload all their contact (from local excel file) into the local server or personal computer, and you can even schedule your broadcasting campaign easily from this software. In summary, SMS marketing for election is always a big challenge for the government in making sure no one is abusing the telecommunication channel to broadcast some misleading or fake information to the mobile users in this election, as this may affect to the stability of our country. Below is the news that I copied from TheEdge and it did mentioned on the regulation if anyone has abused the used of SMS for their election purpose.